What happens when, once a year, the urge to accommodate every consumer fashion meets massive Jewish cultural illiteracy? 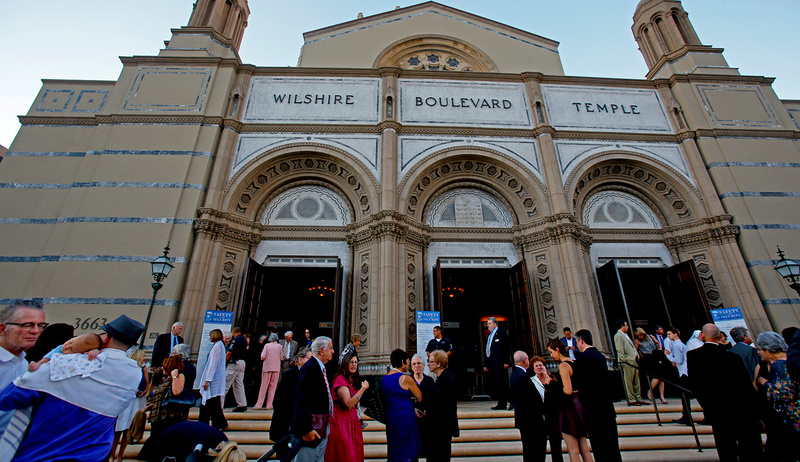 Congregants outside Wilshire Boulevard Temple in Los Angeles. Anne Cusack/Los Angeles Times via Getty Images. It’s long been a given that American Jews who rarely if ever attend religious services throughout the year come to synagogues in droves on the High Holy Days. To enlarge their sanctuaries, synagogues open movable partitions; to accommodate even greater throngs, they may hold “overflow” services in their social halls, in rented theaters or, when necessary, in large tents. When even these prove insufficient, enterprising rabbis open “mushroom synagogues” that like their namesakes pop up briefly in the early fall and disappear just as quickly. This surge in worshippers—some congregations experience a ten- or even twenty-fold increase over attendance on an average Sabbath—is simply taken for granted. Yet it’s actually quite a remarkable phenomenon. True, Rosh Hashanah (the Jewish new year) and Yom Kippur (the day of atonement), also known as the Days of Awe, represent the most intensely religious period on the Jewish calendar, and many Jews undoubtedly resonate to their emotional pull. But the days also feature the calendar’s most demanding services, with Hebrew prayers that are not only lengthy and (deliberately) repetitive but are all but incomprehensible to the large majority of non-Orthodox Jews. A further potential impediment is the prayers’ theology, which presents a conception of God alien and certainly discomfiting to many moderns. This is consumer Judaism at its worst: customers guilted into experiencing a mediocre product. It’s Judaism at its least interactive, least embodied, least kinesthetic, least engaging. It’s more show than service. If these common stereotypes were true, it would be worth an effort to fathom why several million intelligent, well-educated people with other options for how to spend their time bother to attend at all. But do the many caricatures reflect current reality? Is the experience of the High Holy Days in synagogues across the country actually so dull and soul-deadening? Or does the problem, if there is one, lie altogether elsewhere? To answer these questions, in recent years I’ve interviewed dozens of rabbis functioning in various types of synagogues as well as leaders of smaller start-up prayer groups and niche congregations. In what follows, I’ll be quoting from their responses. The rabbis in question serve non-Orthodox Jews—that is, the vast majority of American Jews—in Conservative, Reform, Reconstructionist, Renewal, and other, non-denominational settings. Only rarely will I address the situation in Orthodox synagogues, which, especially in major urban centers, differ radically from their non-Orthodox counterparts. Almost without exception, rabbis of different non-Orthodox denominations speak forthrightly about the practical obstacles facing their congregants at High Holy Day services. I’ve already noted one such barrier: the Hebrew language of the prayers, a language familiar to fewer and fewer today. Many lack the skill even to read the prayers, let alone understanding them, and therefore cannot join in congregational singing without recourse to transliterated prayer books. The very form of public prayer can be off-putting to those who rarely, if at all, engage in it during the rest of the year. According to the 2013 Pew survey, among members of Conservative synagogues, 39 percent claim to attend only on the High Holy Days, a figure that leaps to 60 percent among members of Reform temples. After going an entire year without exercising whatever faculties come into play during public worship, many find it all the harder to enter into the spirit of High Holy Day prayer. The goal of rabbis today is not to rebuke attendees for their failures but to help them connect to at least some aspect of their Jewishness. This isn’t to say that rabbis are happy about the severely limited involvement of congregants in the life of the synagogue and religious practice. But “guilting” attendees is deemed counterproductive. Whatever the rabbis’ private feelings, publicly they shift to generic messages of self-improvement, with the typical stress being placed on treating oneself and others in a more wholesome fashion. Far less, if any, attention is devoted to the importance of becoming a more actively engaged Jew. To help congregants get into the right spirit for the High Holy Days, synagogues begin to talk up seasonal themes early on. Two examples: a number of Reform temples send out brief email messages every day during the month before Rosh Hashanah to help members prepare; reversing the process, a Conservative rabbi invites congregants to let him know what they need to hear from him. Both exercises are meant to spur reflection on the holidays to come, and both elicit responses in written form. In addition, many rabbis announce a theme that the synagogue will highlight throughout the Days of Awe. Examples: “What does loving God mean to you?” “What do you see when you look in the mirror?” “What goals are you setting for yourself as the New Year approaches?” Mailings sent to congregants discuss not only logistics—many synagogues run multiple services and need to explain the differences among them—but also variations on the season’s selected theme, including suggestions for related inspirational readings. Synagogues of all varieties also offer workshops on the liturgy and how-to lessons for joining in congregational singing. Although relatively few congregants actually avail themselves of these opportunities, those who do are better prepared. A few rabbis speak of proactively testing the waters by asking adult and teen congregants informally to characterize their conception of God. The results suggest a fair amount of confusion, embarrassment, and inarticulateness, even as some hold fast to traditional beliefs. A more ambitious survey undertaken by one Reform rabbi, sent out the day after Yom Kippur, shows, consistent with national surveys, the majority (60 percent) affirming belief in God, but opinions divide on the nature of this God. Of course, this is but a single survey of a single Reform congregation. But it comports with testimony by numerous Reform rabbis about their many congregants who struggle with or are actively repelled by traditional conceptions of God. Nor does such theological skepticism reside within that denomination alone. Conservative rabbis also report private conversations with congregants unsettled by the traditional conception of an omnipotent God who intervenes in earthly matters and hears and responds to prayers. “I told a congregant . . . that I also don’t believe in that kind of God,” states a Conservative rabbi on the east coast. A west-coast colleague, speaking of his younger congregants, confirms that “that kind of God” doesn’t interest them, either. As a side note, similar doubts exist among some Orthodox Jews as well, with a September 2017 survey showing just over half of Modern Orthodox Jews fully agreeing with the statement, “God is involved in all day-to-day activities and guides the events of my life.” On a comparative basis, moreover, American Jews in general are considerably less likely than Christians to believe in the God represented in the Bible—or in the God whose majesty and judgment are so central to the liturgy of the High Holy Days. In their public discourse, therefore, the most common solution favored by rabbis across the spectrum, including in Orthodox congregations, is to sidestep questions of belief altogether. Sermons tend to focus on self-improvement, controlling one’s anger, taking stock, or acting with kindness toward family, friends, and others. When God is invoked, the formula tends to be couched in the subjunctive mood: “What would change in your life if God were real?” a rabbi asks his congregants. Rather than talking about sin, rabbis prefer to ask how you might be “missing the mark” and to help you look inside yourself, connect with your emotions, or soothe your anxieties—none of which entails a relationship with God. To fill the vacuum created by congregants’ theological doubts, clergy also devote much energy to shaping religious services that, as one rabbi puts it, are “multi-sensory experiences.” They carefully plan and coordinate the choreography and music, select in advance themes that address congregants’ real-time concerns, post leading questions or inspirational messages in spaces housing prayer services and in heavily trafficked hallways, and ensure that sub-groups—tots, young children and their parents, teens, millennials, empty-nesters—are all properly accommodated. Advanced planning also goes into mood-setting by means ranging from emotionally evocative readings and exercises to atmospheric lighting. Congregants arriving at the synagogue may be greeted by squads of welcoming volunteers, some of whom, performing this task year-in and year-out, become the friendly faces sought out by infrequent attendees. Once inside, hospitality is steadily communicated through public announcements and in ceremonies tailored to specific categories of congregants. Examples include those who have been bereaved in the previous year or have suffered an illness, and who may be offered an opportunity to be called to the Torah as a group. Similarly, various alternative services signal an attunement to particular age groups, or to early risers or latecomers. Traditionalists can find a setting where more of the traditional liturgy is recited; for those seeking something briefer, there are “greatest hits” services. A “family service” at a Midwestern Reform temple, which lasts only one hour and includes only the “highlights,” regularly attracts 1,500 people of all ages. Most notably, as rates of intermarriage have soared, Reform congregations have gone out of their way to welcome intermarried families. The High Holy Days in some Reform temples are a time to thank Gentile spouses who are actively involved in raising their children as Jews. In addition to abridging lengthy services, synagogues may also tinker with the order of the prayers. Because most attendees confine their time in the synagogue to the hours between 11:00 am and 12:30 or 1:00 pm, a Midwestern Conservative synagogue shortens the preliminary and morning prayers to ensure that the highlights of the day—the sounding of the shofar or the memorial (Yizkor) prayers, the sermon, and the additional (Musaf) service—fall within this interval of one-and-a-half to two hours. On Yom Kippur, Reform temples tend to shift the Yizkor service to mid-afternoon, followed by a guest speaker or speakers and then the closing service. By thus rejuggling the order of things, the synagogue is able to woo members who have left early but will now return to spend the closing hours of the day at worship. Synagogues of different stripes also create an elaborate child-oriented pageantry for the recitation of havdalah marking the end of Yom Kippur and the reintroduction of “normal” weekdays. As lights are dimmed, hundreds of children march to the front of the sanctuary carrying light sticks. At least one Reform congregation concludes by inviting parents of babies born during the previous year to come forward with their offspring, symbolically beginning the new year with the celebration of new life. All of these ceremonies, even as they offer an opportunity for young people to play an active role, make it necessary for parents to be present in the synagogue if for no other reason than to chauffeur their children to and from services. In some synagogues, members are invited on Yom Kippur to call out a sin they repent or have seen others commit—a far cry indeed from past synagogue practice. In general, today’s synagogues make it a priority to move their congregants from passive to active modes. Parceling out honors is one way to get people involved. Families are asked to open or close the ark, recite passages from the liturgy in a call-and-response fashion or read excerpts from poems and inspirational texts. A Reform rabbi on the West Coast notes how no fewer than 239 families were accorded synagogue honors during last year’s High Holy Days, roughly a quarter of the congregation’s family units. In some synagogues, members are invited during the recitation of the litany of sins on Yom Kippur to call out a sin they repent or have seen others commit—a far cry indeed from past synagogue practice in which the clergy was assigned the role of officiant while all others constituted an essentially passive audience. Some synagogues, indeed, invite congregants to move from their seats in order to be near an officiant. In start-up settings, it’s common for members to stand next to the prayer leader and sing along or beat time on the table to the rhythm of the music. A New England Reform temple distributes as many as 30 individual shofar players throughout the synagogue building for congregants and their children to gather around. One of the more striking barrier-breaking customs embraced by a number of non-Orthodox synagogues comes during the recitation of what some term “the Great Aleinu.” The reference is to a prayer affirming the all-encompassing sovereignty and oneness of God that is recited in the three daily prayer services as well as on Sabbaths and holidays. During its recitation on the High Holy Days, Jews traditionally prostrate themselves with heads to the ground—a practice that among non-Orthodox Jews fell largely into disuse. In recent years, however, a number of synagogues have re-appropriated the tradition, encouraging congregants first to kneel and then to stretch out prone with their faces to the floor. A significant portion give it a try (evidently without compromising their principled disbelief in the one sovereign God), and many have praised it as a way of introducing “mindfulness” into their experience of the day. A somewhat similar approach is followed at a Reform temple where people jot down on red slips of paper a behavior they regret having engaged in during the previous year. When the congregation recites the portion of the Yom Kippur service recalling the High Priest’s temple rite in ancient times, congregants place their red slips around a Torah scroll as an act of expiation. It is their own guilt offering, meant as a modern counterpart to the sacrifices made in the temple in Jerusalem before its destruction. One of the biggest draws on Yom Kippur is the Yizkor memorial service when congregants recall deceased relatives and loved ones. Traditionally, rabbis introduce the service with words intended to help congregants connect with their feelings of sadness but also to evoke a sense of gratitude for how the deceased enriched the lives of those still living. It now has become more common in some synagogues for rabbis to dispense both with this sermon and the Yizkor prayers altogether, instead encouraging congregants to engage in a thought exercise. No feature of the High Holy Days has been rethought more comprehensively than the music. For a good many centuries, Jews in different lands developed a set of distinctive melodies for particular prayers and an overarching musical mode (nusaḥ ha-t’filah) reserved for the entire High Holy Days period. In recent decades, synagogues of all kinds have modified, if not abandoned, the traditional nusaḥ. In order to enliven congregational singing, prayer leaders in Orthodox and Conservative synagogues have adapted wordless melodies (niggunim), Israeli yeshiva music, and the compositions of Shlomo Carlebach and others. Reform temples, more than others, experiment with contemporary music, especially songs composed by younger musicians drawn from the movement’s own network of summer camps. Orthodox synagogues excepted, many congregations also now incorporate instrumental music into their services. Where once organ accompaniment was popular, and then guitar music after the 1960s, our time prefers drums, flutes, clarinets, and violins for setting a mood and drawing congregants in. Often the musicians are recruited from within the congregational body. Experienced trumpet and other brass players are easily transformed into expert sounders of the shofar. Some Conservative synagogues report they have benefited from the accomplished musical skills of members who bring a high level of professionalism and experimentation to the service. Not uncommonly, synagogues will set the words of the traditional liturgy to pop melodies as a way to “bring people to the liturgy, even though they don’t understand the Hebrew,” as a Conservative rabbi explains. As a case in point, she notes how at one service she herself set the Adon Olam hymn to the tune of Stevie Wonder’s “Signed, Sealed, Delivered, I’m Yours,” a melody well-known to younger attendees. Leonard Cohen’s “Hallelujah” is a new staple in some congregations, despite its religiously subversive lyrics. In some settings, a pop song thematically connected to the message of a sermon is sung by the congregation; for example, a congregational rendition of Elton John’s “Sorry Seems to Be the Hardest Word” will immediately follow a sermon about making amends. All of this requires considerable planning: rehearsals to make sure that instrumentalists, performers, and choirs are in synch; coordination by teams of synagogue clergy to time the various mood-setting sermons, commentary, musical renditions, call-and-response prayers, and pageantry. Enormous effort goes into ensuring the success of these “high production values,” as one Reform rabbi calls them. No doubt, readers who have followed me to this point will have had different reactions to the practices I have described, some finding them impressive, others weird, hokey, pandering, sacrilegious—or simply familiar. My purpose in surveying them has been aimed strictly at disproving the still-common labeling of synagogues as hopelessly fixed in their ways, oblivious of broader cultural trends, and indifferent to their congregants’ experience of the High Holy Days. No doubt a number of congregations still do remain stuck in a routinized mode of prayer, while others lack the financial and personnel resources to offer multiple options. But for many hundreds of American synagogues—especially the larger ones—and for dozens of more informal settings, such outmoded stereotypes bear little or no resemblance to actuality. Nor are such censorious views confined to young people. One foundation professional interviewed by me stated without qualification that “synagogues are finished.” When pressed, she admitted that her generalization did not apply to her own family, or to mine, but insisted it held true for most young American Jews. Recent critics agree that in our radically disruptive age, so-called legacy institutions are passé, and none more so than synagogues. Convinced of this assessment, many major Jewish philanthropists have in turn written off synagogues as unworthy of their attention, let alone their support. Big givers have established national organizations to strengthen Jewish day schools, residential summer camps, social-justice efforts, and Jewish campus activities. Synagogues are left to their own devices to figure out how to present their religious services and messages in an accessible fashion—the very challenge that, as we’ve seen, clergy and boards have not only risen to but have impressively met. This particular drumbeat of criticism, then, is wholly misplaced. That is not to say, however, that criticism is unwarranted. Consider again how the challenge faced by non-Orthodox synagogues has been met: mainly, by a headlong rush to accommodate every consumer demand, no matter how unreasonable or contradictory. Synagogues are expected to have a clear mission, but also to serve as a big tent, rendering everyone comfortable. They are to be inclusive, but also must take the “correct” positions on the most divisive issues of the day. They are to stand for Jewish values, but to do so by aligning both themselves and those values with vague but faddish nostrums: hospitality, diversity, spirituality, creativity, non-judgmentalism, tikkun olam, personalized religion. In the headlong rush to make synagogues more accessible on three days a year, what remains unaddressed is the underlying reality of corroding synagogue life during the rest of the year. By embracing this playbook, congregations are indeed making themselves more accessible—and appear to be eliciting positive visceral responses from attendees, at least on three days a year. What remains untouched and unaddressed is the underlying reality of corroding synagogue life during the rest of the year. For growing numbers of Jews, synagogue attendance has become a sometime thing at best. Congregants may enjoy a wonderful experience on the High Holy Days, but this suffices as an annual pilgrimage, a once-a-year opportunity to reconnect with family, congregation, the Jewish people, and some form of Jewish life. Between this Yom Kippur and next Rosh Hashanah, the same congregants will keep religious engagement to a minimum, or eschew it entirely. No rabbi I spoke with was indifferent to this reality, but most shrug it off in their otherwise laudable eagerness to make themselves available to all comers. As for those Jews, most Jews, who remain content with their once-a-year Jewish experience, well, the rabbis effectively respond, it’s a free country. Connected to infrequent participation lurks a second reality acknowledged matter-of-factly by rabbis across the non-Orthodox spectrum: despite their efforts, most attendees on the High Holy Days are still clueless about what is transpiring in the synagogue during worship. A West Coast Conservative rabbi contrasts his current congregants with those of two decades ago, noting that in the past “there still were reflexive Jews who knew how to daven [pray], but they’re dying out. The current population does not have the vocabulary or Hebrew and High Holy Day literacy.” A number of Reform rabbis express exasperation over the “bad Judaism” imbibed by their congregants in prior decades. What he is actually describing is massive Jewish cultural illiteracy. Most Jews do not understand the language of long-hallowed prayers or possess the knowledge that would enable them to make sense of the high civilization reflected in the High Holy Day pageant, or for that matter in everyday Judaism. That is precisely why synagogues resort to every conceivable gimmick to help the uninitiated “relate”—a strategy that, however efficacious in attracting a larger crowd and keeping it in the synagogue for longer periods of time on one or two days of the year, does little to reverse the underlying problem. Even more troubling, by reinterpreting the High Holy Days to fit the fashionable tropes of the day, newly reimagined services reinforce the destructive mindset undermining all religious commitment in our time—the reduction of everything to a matter of personal feelings, the valorization of solipsism to the point where what counts most is the gratification of the self, the transformation of every institution into either a therapeutic milieu or a marshaling ground for political activism, the commodification of every human activity so that religious institutions can “market” and “rebrand” themselves as agents of “change” and “disruption” rather than as embodiments of a tested, millennia-long tradition. In short, in the effort to work around their attendees’ lack of cultural literacy, synagogues are not only ratifying that lack but absorbing into Jewish life much that is inimical to Jewish life. And that, far more than dull religious services, is the actual—and unaddressed—crisis of American Judaism today.